Camotes Islands (or Camotes Group of Islands) are islands located somewhere in the middle of bigger islands of Cebu, Bohol and Leyte. Camotes is composed of four different islands namely Poro, Pacijan, Tudela and Tulang. The different municipalities are Poro, Tudela, San Francisco (the town center) and Pilar. Only the town of Pilar in Ponson Island needs another ferry ride once you get to Consuelo port from the wharf in Danao City. Now Camotes Islands slowly emerge as another tourist hub in Central Philippines because of its simple beauty and amazing nature wonders like Lake Danao Park, Timubo Cave and their white sand beaches. Plus a community of friendly people. 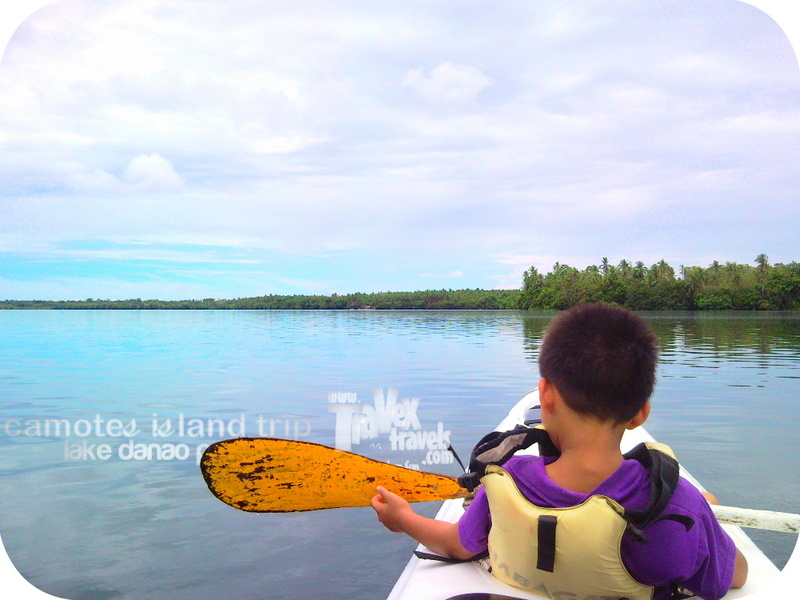 Kayaking in Lake Danao Park, Camotes. THE ISLANDS. Camotes is 62 kilometers northeast of Cebu City and the most accessible way to get to Camotes Islands is to go to Danao, a city north of Cebu. 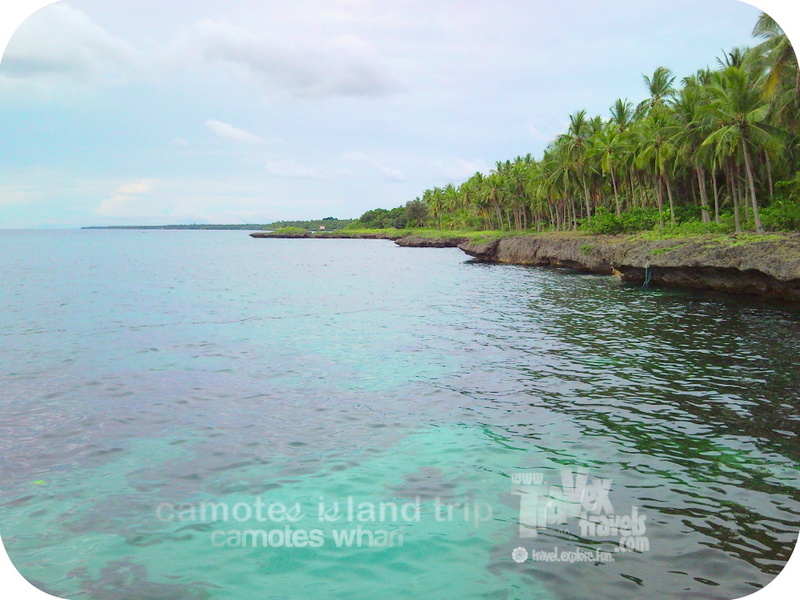 To know more how to get to Camotes, read “How to Go to Camotes Island”. The islands are pristine indeed and you can feel the ambiance of nature once you get there. The life there is so simple. Farming and fishing and you live life in Camotes very well. I also noticed that the mountains of the islands are fully covered with trees and grasses. It’s good to know that people there preserve blessings of nature. And I swear when you get there you’ll really notice why it is so-called “Camotes”. I saw a vast land of “kamotengkahoy” or cassava growing in the meadows of Camotes Islands. THE RESORT. If you plan to tour all the tourist spots in Camotes and enjoy it as well, you can extend for two days and stay at the resort of your choice. Resorts are located in Mangodlong and Santiago though I cannot compare them because I have not slept there. You can also have a day tour only like what we did and it’s already enough for you to experience Camotes (without booking for a night stay there). 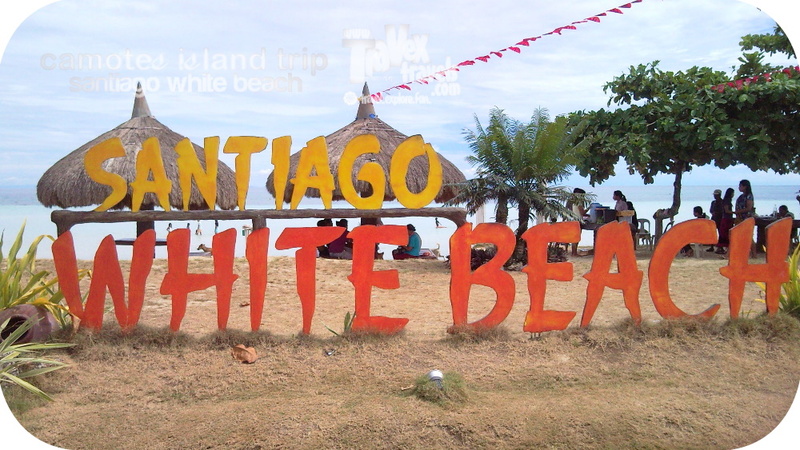 You also have to know that the different tourist attractions in Camotes are kilometers away from one another. THE LANGUAGE (OR DIALECT). People in Camotes speak Cebuano (or Bisaya). Nothing different except for some info I read that Camotes Visayan in Poro (Porohanon) is a little different from Cebu Visayan because they pronounce /y/ as /z/ as in “maazo” rather than “maayo”. THE TRANSPORTATION. It is clear that Camotes Islands are located north of Cebu City, and for that, you have to go to the North Bus Terminal and ride a jeepney or bus going north. You can also ride at SM Transport Terminal in Cebu but if you will be early then better head to North Bus Terminal. The one we rode was a bus going to Borbon, a town located north of Cebu City and we dropped off beside the road which is just three minutes away from the port. There are also jeepneys heading to Danao. There are two wharfs there so make sure you get into the right one. Once you are in Camotes, you either choose whether to ride on a habal-habal (or a motorcycle) or a van. Of course the four-wheeled vehicle is more expensive to hire than the two-wheeled one, but you also have to consider safety and adventure factors. If you have kids with you, I do not recommend habal-habal. If you are adventure seekers like us, try habal-habal, it’s an experience. Oh just remember about the sunburn when you choose it. THE FOOD. Oh yes the food, if I were you I will buy food in Cebu City already or in Danao City. I cannot say that food is scarce in Camotes but I find it not really accessible. Or maybe I just didn’t find much when I was there. And besides it would be more expensive to buy food there. But of course if you plan to stay in a resort, then you have to try their food. With regards to your light snack like biscuits and water, you better buy it in the city in mainland Cebu. And really, if only I knew how scenic Danao Lake is, I would have brought my pack lunch and ate it inside the park. It would have been awesome. Though you don’t have to worry because there is a store inside Lake Danao Park if you happen not to bring any food of sort. THE BUDGET. And the good thing here is that, if you are a solo traveler and you packed your lunch and snacks, P1000.00 is already enough for you to explore the major tourist attractions in Camotes. Less of course the floating cottage in Lake Danao Park and booked accommodation in any of the resorts. I paid P500 for the habal-habal driver in exchange of a whole day tour service to the different attractions. I don’t find habal-habal to be that dangerous in Camotes, because there are very few vehicles driving along their roads and most of the paths are already paved when I visited there. THE MONEY. Mark my words: bring CASH. I do not recommend you solely relying to your credit card or debit or ATM card. People there are not yet used to these cashless transactions, remember it is nature tripping and not city escapes. Entrance fees are paid in cash and the fees do not tantamount to thousands of pesos. Affordable indeed to escape the hassle of city life. So there, I just presented you a simple list of things you may consider when you have your travel to Camotes and have Camotes island tours. Just though remember that the other things are for you to discover when you are already in Camotes, so go ahead and enjoy life traveling, exploring and having fun in the Philippines! Scenic sunset over mountains and seas on going back to Danao, Cebu. Be sure to catch the 4 PM departure.